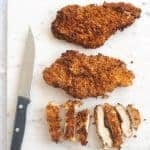 This parmesan crusted air fryer chicken breast is crispy, deliciously moist and best of all healthy! Your family will gobble it up and the recipe is so easy, it will go on your list of easy weeknight dinners! I recently got a brand new air fryer and ever since it’s gotten very little time off. The air fryer has made my meal prep so much easier! I love that I don’t have to preheat it and everything comes out tasting delicious, like it roasted for hours! One of my favorite things to eat for lunch has been air fried veggies and seafood with a side of Trader Joe’s cauliflower gnocchi. I’ve definitely upped my veggie intake since I started air frying! 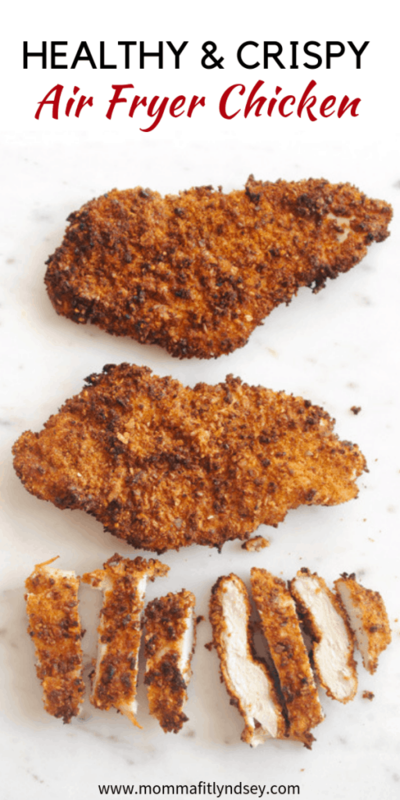 If you’re tired of dry boring chicken, it’s time to give this air fryer chicken breast recipe a try! This recipe uses delicious coconut flour to get a crispy outside. 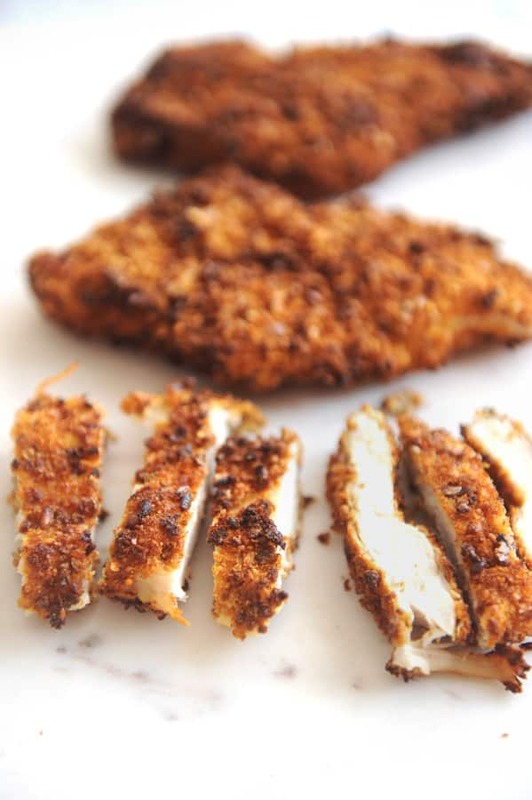 This recipe has quickly become one of my favorite gluten-free and keto air fryer recipes! Are you looking for the best air fryer out there? There are so many to choose from now, but here are a few top picks. These are the top three air fryers on Amazon Prime and they are all under $80! These are the top tips for using your air fryer! You can open the cooking chamber and shake the pan for even cooking. Cook food in one layer to make sure both sides get crispy. Don’t air fry wet food! Check out the recipe below for how I make sure the chicken is dry. Don’t overcook! The air fryer can dry food out if you cook it for too long. If necessary, preheat Air Fryer to 390F. Spray roasting pan with olive oil spray. Trim chicken breast of excess fat. Be sure to butterfly chicken breasts or pound to no thicker than 1/4 inch. This is an important step to make sure the chicken cooks thoroughly. Measure out breadcrumbs and Kodiak cake mix into two separate bowls. Season breadcrumbs and Kodiak cake mix evenly with spices. Add parmesan cheese to the breadcrumb bowl. Put egg in third bowl and scramble with a fork. Line up the bowls in order of Kodiak Cakes mix, egg, breadcrumbs. Dredge chicken in flour then dip and coat into eggs. Coat with breadcrumb mix on all sides. 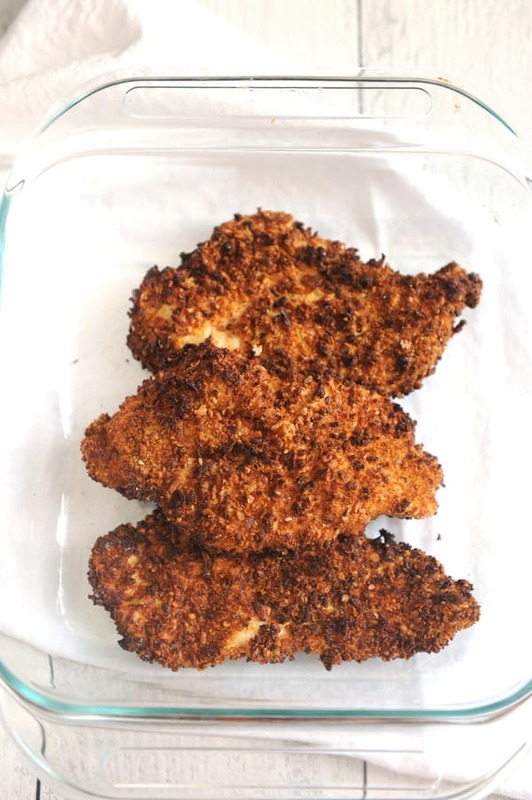 Place chicken in air fryer and cook at 390F for 4 minutes. 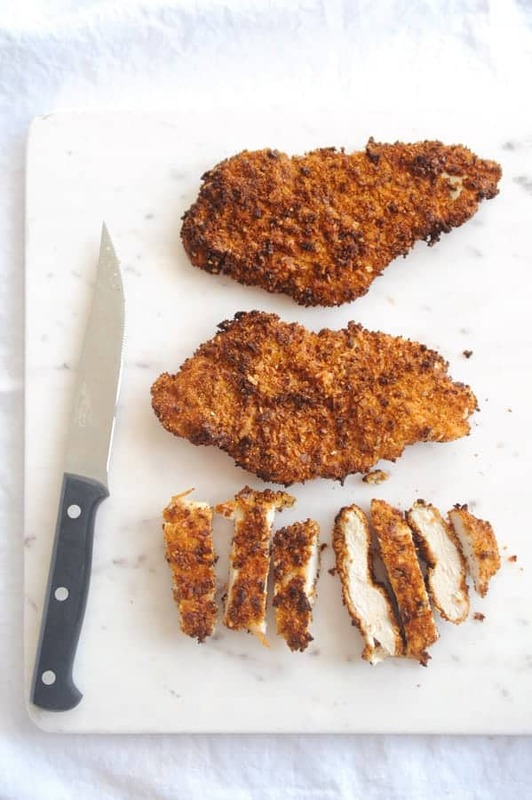 Flip and cook for 2-4 minutes depending on thickness of chicken. Chicken is cooked at 165F and is best determined with a meat thermometer. Cook until done. Serve with pizza sauce and extra parmesan for a delicious meal! 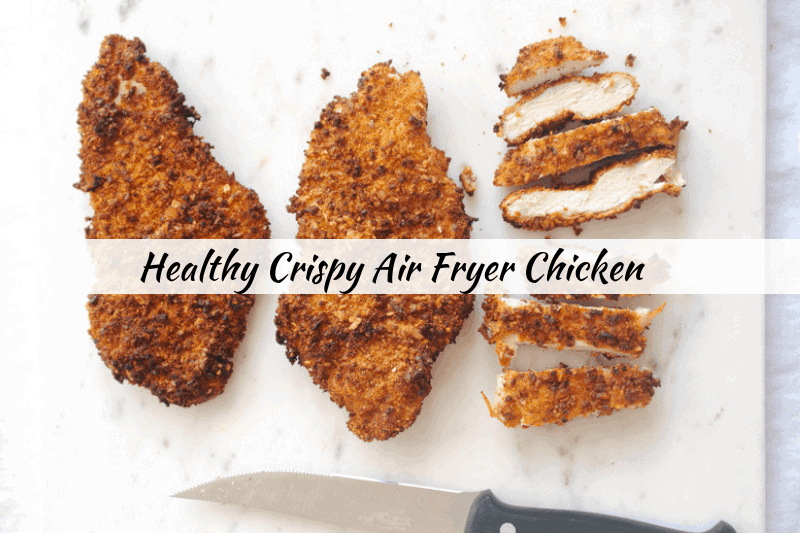 Do you own an air fryer? What is your favorite recipe to make? Tell me about it in the comments! Join 43,000+ other followers and subscribers in getting more healthy family tips on a budget right to your inbox! Download your FREE Easy, Healthy Weeknight Recipes Cookbook below!